LBA supported Costain’s Tunnelling team in site engineering positions. During the construction phase LBA were involved in the management of on site tunnelling works as well as setting out and precise monitoring management. 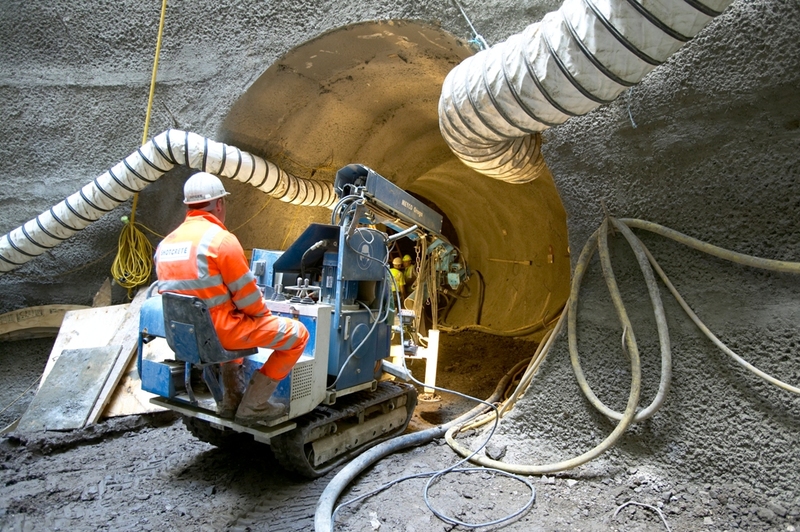 The 7DCF – Hampton Pump Out Shaft (HPOS) and the associated connection tunnels constructed at the Hampton Advanced Water Treatment Works (AWTW) were part of the AMP4 Thames Water Hampton Projects. 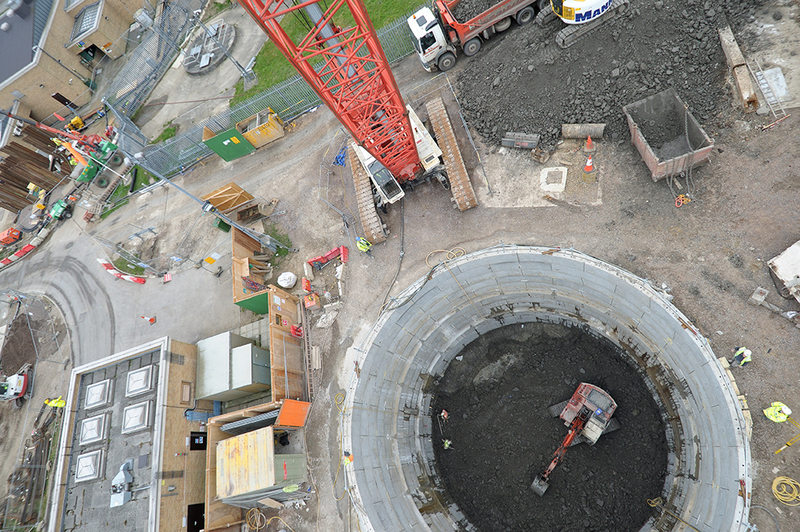 The contract involved the construction of a 15m ID main shaft (HPOS), 40m deep, to replace an ageing pumping station (Stilgoe House), using two distinct methods: underpinning and sprayed concrete lining (SCL). A sprayed concrete lining tunnel, 3.7m ID, connecting the HPOS to existing Thames water (TW) infrastructure; a 2.2m ID pipe-jacked tunnel connecting the HPOS to Stilgoe House and a 5.2m ID surge column shaft for installation of surge column pipework, sunk using the caisson method. To prevent water ingress in the HPOS shaft (SCL areas), a new waterproofing membrane was sprayed, creating a bond between the primary and secondary lining for water tightness. A tight settlement monitoring system was set up to control all ground and building movements on the TW infrastructures and the dense underground pipework system. LBA provided a Senior Engineer involved in giving site engineering support to Costain’s Tunnelling team on this technically varied and challenging project. Day to day duties involved management of teams, plant and materials, producing method statements, inspection and test plans and quality documentation to support construction activities, setting out and precise monitoring settlement management. The Main shaft was sunk using two distinct methods. The first stage down to 23m from ground level using underpinning pre-cast segmental lining excavated through an old TW building (brickwork, concrete slabs, and old pipes), gravels and London Clay. The second stage was built using permanent sprayed concrete lining (SCL) from the pre cast segments to the bottom base slab (38m deep): primary and secondary lining dug through dry London Clay. The mix design had plastic fibres used as permanent structure replacing the need of using reinforcement steel or mesh. Installation of a new sprayed waterproofing membrane between the primary and secondary lining. The SCL tunnel was driven through London Clay using the new Celtic Miner 4500 (Metal Innovations). The digger has a rotary bucket head and a flexible arm to cut to the correct profile, heading and invert as well as a through conveyor fed by the bucket. The use of this machine removed the need for hand excavation (small tunnels) and hence helped prevent Vibration White Finger. An accurate survey was required of the existing TW shafts and pipework. Pipejack connection to existing pipework within exacting TW tolerances.